Grains add special fatty acids, complex carbs and lots of nutrients. A is for Amaranth, B is for Barley. Or buckwheat. Move up the alphabet through flaxseed, oats, quinoa (pronounced keen-wa), rice and wheat and food formulators have a huge batch of grains to work with â¦ and to get familiar with. The low-carb trend has distracted food processors from the use of complex carbs and multi-grains, but there’s room for common ground. Some of these grains offer a variety of oils, fiber and phytochemicals, as well as complex carbs. The importance of whole grains is shown in the Healthy People 2010 objective, the 1999 USDA outline for several nutrition initiatives, which calls for an increase to three servings of whole grains per person, up from about one. And there’s so much variety in flavors, texture and nutrients that increased consumption of whole grains is pleasant, not at all boring. The growth of vegetarianism, which requires vegetable crops with relatively high and complete protein levels. The need for grain sources that do not contribute gluten for sufferers of celiac disease or those who are allergic to glutens. The desire for more versatile grains for ethnic meals. The use of specific grains for nutrient content. There is also the curiosity of Americans, who want something different. Artisan breads may have been a start, but now multigrain cereals, snack crackers, side dishes, pastas and similar products are appearing, first in health food stores, then artisanal bakeries, and now the mainstream. Some of the so-called "minor grains" are grown in small quantities because of their agronomic utility, and are relatively off the trading radar screen. According to Food Production Daily, the world grain carryover for major grains is at 59 days of consumption, well below the 70 days considered necessary for food security. Wheat and corn are at seven-year record high prices. With a harvest coming up, an increase of 120 million tons will be required to overcome last year’s shortfall of 104 million tons plus an extra 15 million tons to feed the global increase in population. If it doesn’t happen, prices will be up for major grains, and the differential between wheat and other grains will shrink. Minor grains including barley, rye, oats, sorghum and millet are joined with more exotic grains. Prices are harder to predict, but they are likely to be grown in larger quantities in the near future. They have agronomic possibilities, especially in hotter, drier climates. Some require less fertile soil, others will tolerate wind and salt water. In many parts of the world, these grains become a staple of diet. Because of the emphasis on corn, soybeans and wheat as principal crops, the "minor grains" are harder to source, and may require contracting to assure a steady supply. There are agronomic efforts to improve the major crops as well, including increased emphasis on growing the best grain for a specific use, which brings us to identity preservation. In effect, a specialty corn or wheat resembles a minor grain in its marketing and development. Amaranth, a relative of the ubiquitous pigweed, is becoming popular crop, perhaps because it contains three times as much fiber as wheat, and five times the iron. It has double the amount of calcium as milk, and is rich in lysine, an amino acid that is usually lacking in grains. It has a digestibility of about 90 percent when cooked. Amaranth is offered as a pre-gel or puffed grain portion, flour and toasted flour, separated starch and as rolled flakes that look much like rolled oats. Amaranth oil is also available. Amaranth can be used in baked foods, beverages, energy bars and supplements, notes Larry Walters, a food scientist and president of Nu World Amaranth Inc. (www.nuworldamaranth.com), Naperville, Ill., which grows, processes and uses the grain. The company has introduced a number of cereals: one is extruded and shaped like little O’s and another version includes strawberry. Nu World also produces baking mixes. The first of the products appeared on supermarket shelves in 2002. Barley, like oats, is high in beta-glucans, the soluble fiber that has gained a nutritional claim for helping to reduce heart disease. Barley is offered in pearl barley, which can be cooked alone as a vegetable or side dish, or a variety of grain fractions, including barley flour, high-fiber barley and extruded barley products. Bob’s Red Mill Natural Foods Inc., (www.bobsredmill.com), Milwaukie, Ore., sells barley flour and pearl barley, and includes it in some bakery mixes. Bob’s also has introduced a 50-product line of gluten-free products, which eschew the gluten-continuing grains (wheat, triticale, rye, and barley, as well as oats) in favor of rice flour, various bean flours, sorghum, buckwheat, millet, quinoa and teff. "The gluten-free products are milled and prepared in a separate room, where gluten-containing grains are never processed," says Matt Cox, Red Mill’s marketing coordinator. "The GF products have become much more popular over the last 10 years, as people discover that celiac disease is really disabling." Waxy barley is a different rain from regular barley and contains about twice the amount of beta-glucan. Wally Coram, vice president of sales for NuWorld Nutrition (no connection with Nu World Amaranth), Minneapolis, notes that a number of consumers who eat the cereal daily have maintained their cholesterol levels. "There are a number of clinical trials in progress, as well. Waxy barley is a naturally occurring mutant and a distinctive, different grain with a lot of utility." NuWorld Foods (www.nuworldfoods.com) sells hulless waxy barley flakes by mail order to the public in 3-lb. bags. Getting back to Bob’s Red Mill, some of the company’s special grains are Identity Preserved and are grown by selected farmers. One such grain, buckwheat, is related to rhubarb, sorrel and dock. It isn’t a cereal, but is a three-cornered seed that looks much like a beech nut. There are two types—common buckwheat grown for buckwheat flour and Tartary buckwheat, used primarily for animal feed. Buckwheat flour, of course, is used in pancakes and pancake mixes, but it has also shown great versatility in natural grain mixes. Flaxseed is a grain that contains Omegaâ3 oils, and so it is a popular grain for addition to cereals. It’s sold as a whole seed in health food stores, but the whole seed should be milled to make the omega-3 oils digestible, according to Robert Weishear, a food scientist with Hodgson’s Mill Inc. (www.hodgsonmill.com), Effingham, Ill.
Hodgson’s Mill uses a patented selection system for flaxseed, then chill-mills it to keep the oil intact and adds it to the company’s Multi-Grain Hot Cereal and a variety of other products. Products include oat bran, cracked wheat, soy flour and other carefully ground grains. 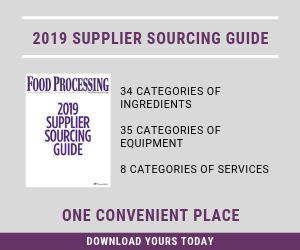 "Our low-temperature milling process, seed selection process and careful handling permit ground flaxseed, in products or as a grain supplement, to maintain about a year’s shelf-life," says Weishaar. "We do as little to the grain as we can to provide all of the benefits possible to our customers." Hodgson’s Mill has been around since 1882 and has national distribution in supermarket chains and health foods stores. The company’s product line includes whole-grain pasta, baking mixes, flours and ingredients for bakers, as well as the specially cold-milled flaxseed. The key to its 122-year success is not to follow fads, but to provide good, healthy foods. Says Weishaar, "I haven’t really noticed a lot of concern about carbs in response to the Atkins diet. Our customers are already aware of good nutrition. Whole grains offer fewer net carbs than refined flours in any case, and our customers generally know that." Another major company has been vitally involved with unusual grains is Roman Meal Baking Co. (www.romanmeal.com). Located in Tacoma, Wash., the family-owned firm has produced multi grain bread and similar products designed after the diets of Roman soldiers for nearly a century. Terry Elliott, brand manager, notes the firm has long held that whole grain is the "in" thing. While the low-carb trend may have caused marketing problems for some bakers, it hasn’t for Roman Meal. Its Carb Aware bread, a loaf that is especially high in fiber and protein, continues to do well in selected markets. Elliott says the company "continues to study unusual grains for inclusion in products. We’ve been looking at quinoa because it has some remarkable characteristics and the romance of being an ancient grain." Wheat (red and white, hard and soft, and durum) will produce a record yield this year, according to the U.S. Dept. of Agriculture, and global production is expected to exceed projected demand for the first time in about six years. The key word here is global, as increases in China, Russia, Europe and South America are the result of more acres and better yield. However, the U.S. crop, except for durum wheat, is down, caused by fewer acres planted. Wheat annually has been squeezed by the demand for $6 billion sales of fresh bread consumed every year. As a result, prices for flour — both whole grain wheat and refined flour â have stayed high. But with "the Atkins effect," single-loaf sales of bread fell by about 1.3 million units over the past 12 months, according to data from Information Resources Inc. Dollar sales were flat at $2.2 billion. However, the number of wheat and whole-grain loaves sold rose 3 percent, with the value of the sales up 7 percent to $1.8 billion. Mintel International believes growth in artisan breads, which grew by 18 percent in sales between 2001 and 2003, is a continuing trend. Whole grain varieties were considered the key to growth, while refined flour-containing products have felt the impact of the low-carb trend. "The low-carb phenomenon has made many industries sit up and take notice. I have never seen the food industry jump on board a fad as quickly as this low-carb craze," says Harry Balzer of NPD Group, Port Washington, N.Y. "Restaurant operators and food manufacturers are doing what they can to participate in this wave, but the truth of the matter is that low-carb will follow all the other trends, like low-fat. My advice, offer the low-carb product, but don't build the plant." The tortilla sector had, by 2002, captured about 32 percent of the bread market, according to the Tortilla Institute. Tortillas use either corn masa or wheat flour (hard or soft tortillas), and the increased use of "wraps" instead of buns has brought the sale of tortillas to within a couple of percentage points of white bread. At the recent National Restaurant Assn. show, whole and multigrain tortillas were promoted by at least two companies. Tumaro’s Gourmet Tortillas, Los Angeles, added new grains as well as additional flavors to its 8- and 10-in. tortillas. The tortillas have 6-7 net carbs. A spokesperson at the booth noted the wraps reduce carbs because they are thinner and also because the additional grains increase protein and fiber, which also improves the performance of the tortilla. Another high-fiber, multi-grain tortilla introduced at the Restaurant Show is from Damascas Bakeries, Brooklyn, N.Y. Both firms have developed tortillas or wraps to be cholesterol-free and to have zero trans fats. Rice still rules as the major grain for feeding the world. Yields are up, and development of rice as a grain of commerce goes on. But it also is taking on other forms as ingredients in grain-based foods. The only "whole grain" rice is the relatively unprocessed brown rice. It is becoming more popular as whole grain becomes more acceptable to consumers. As gluten-free foods become more important, rice is offered as rice flour and rice starch. Because rice was one of the original grains examined by the Green Revolution scientists, its genome has been studied and ways to improve it nutritionally have gotten a great deal of attention. Golden rice, the bioengineered rice that contains enough vitamin A to prevent macular degeneration in emerging countries, has been extremely controversial, and hasn’t made it into the marketplace. Yet.